COUNTERTOP DEALERS - ASK ABOUT OUR NEW PROMOTION ON CAMBRIA COUNTERTOP INSTALLATIONS! Your source for Cambria Countertops in Columbus and Central Ohio since 1993. Cambria is the industry leader in countertop quality and design. Only the highest quality of quartz crystals are used, resulting in a depth and clarity that distinguishes Cambria from all others. Their innovation is driving the countertop industry and we are honored to be among a select few who are partnered with this amazing company. From our Cambria Showroom to our Cambria Certified Installation Team, we are proud to represent this American Made and revolutionary countertop product. 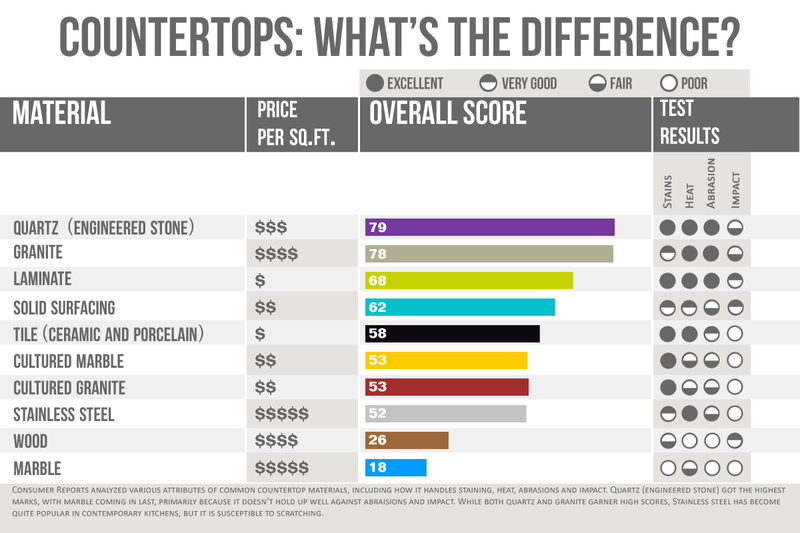 At Top Surface Inc. we offer a wide variety of countertop materials for you to choose from. These products include quartz, granite, solid surface, laminate and even butcher block too. If you need assistance in choosing which product is best for you, contact Shane Tyler of our Sales & Marketing Department and he will be happy to meet with you to discuss which product would best suit the needs of your new countertop installation. In addition, he will provide you with a wide range of countertop design samples to choose from as well. Whether it's from our Showroom or at your remodel project, we work closely with our clients to ensure you get the exact product you're looking for. After placing your countertop order, one of our skilled template specialists will meet with you to confirm any details that you want incorporated into your new countertop design. We employ the latest laser measuring techniques to obtain exact measurements that ensure precision and accuracy for your countertop installation. In addition, we have a professionally trained installation team who were recently recognized for their excellent customer service by the Ohio organization NARI (National Association of the Remodeling Industry). From large commercial projects to our 1-Day Countertop Replacement Program, we consistently go that extra mile to guarantee excellent customer service. Because of our experience, along with industry knowledge, we have earned the confidence of a whole network of kitchen and bath dealers, lumber design showrooms, contractors and remodelers, custom cabinet makers, interior design studios, home centers and flooring stores. Additionally, we have completed a large volume of Commercial and State Projects by working with mill-work houses and commercial contractors. Due to our excellent customer service, we consistently develop strong business relationships with our dealer clients. We view you not just as customer, but as being in a partnership as well. Your business is important to us, and this partnership is always geared towards increasing the sales and success of your countertop business. By providing a defined process of quoting, measuring, CAD programming, fabrication, scheduling and installation, Top Surface Inc. will ensure that each countertop project will be a rewarding experience for both you and your customer. We're here to add value to your business and you can count on us to be a part of your team's success! At Top Surface Inc., we handle all major countertop brands and materials with the knowledge and experience to assist you in choosing which product is best for you. Contact Shane Tyler of our Sales Department today so that he may listen to what your countertop interests and ideas are, and he will help assist you in making an educated buying decision on selecting from the many countertop brands that we are proud to offer. Top Surface Inc. offers the perfect countertop products for your Dream Kitchen & Bath. HOW BIG SHOULD YOUR KITCHEN ISLAND BE? Kitchen islands are a much-sought-after feature — almost nine out of 10 of our Kitchen Design clients inquire about them when placing their countertop order. A well-planned island layout can allow for a smooth workflow and provide a comfortable space for preparing food, dining, working and storage. Watch this video to help you with your kitchen design. The Brands You're Looking For. Benjamin Moore offers a palette of hand-selected paint swatches to perfectly complement your new Cambria® countertops. The tool suggests Benjamin Moore paint combinations that match or contrast your new countertop to bring the perfect harmony to any room. There’s no more second-guessing yourself or carrying around dozens of paint swatches. Simply select the Cambria design and the easy-to-use Paint Match Tool at Cambriausa.com. Top Surface Inc. will install the perfect countertop and you just point, click and pick to find the perfect paint! At Top Surface Incorporated, we realize that your customers rely on the creative vision that you provide. Our company is proud to assist you with that vision and go the extra mile to provide an outstanding customer experience for your clients. Click below for inspiration on your next Kitchen & Bath Design. CLICK HERE TO CHECK OUT OUR 1-DAY COUNTERTOP REPLACEMENT PROGRAM! Lack of space does not mean lack of luxury. Top Surface Incorporated is your source for unlimited countertop possibilities! Call us today so we can help you create your new dream kitchen! Cambria: Offering the most Edge Profile's in the industry. Cambria Design Launch - A Night at The Museum! Last evening received yet another fantastic turn-out to Cambria’s most recent design launch event held at COSI (Center of Science & Industry) in Columbus, Ohio. A large volume of design industry professionals took the opportunity to enjoy the fantastic weather and wonderful atmosphere on the luxurious outdoor patio of COSI. While partaking in the wonderful food and spirits served, the Cambria representatives showcased five of their latest designs in full slabs for everyone’s enjoyment. In addition, guests were treated to a special viewing of a behind the scenes making of the movie “Legend of Cambria”. A film that Cambria announced the release of this past March. The film is narrated by actor Collin Farrell and depicts Welsh history and the Cambria brand heritage. These amazing new designs have been inspired by the stunning imagery displayed in the film. The film can be streamed online at www.CambriaUSA.com. For information regarding future Cambria events, please contact Shane Tyler of Top Surface Incorporated at Shane@TopSurfaceInc.com. Inspired by the majestic landscapes of Wales, every Cambria® design is a masterwork of unsurpassed natural beauty. Introducing five bold new Cambria designs with incredible clarity and quality to beautifully enhance any space. DEBUT YOUR NEW CAMBRIA® COUNTERTOP. SPOIL YOUR FAMILY AND FRIENDS BY HOSTING A CAMBRIA PARTY. You just had your new and beautiful Cambria® countertops installed so now it’s time to celebrate. Let us help you show off your incredible new space by throwing a Cambria Debut for you and your friends. We’ll provide drinks and light food as we roll out the red carpet for your big night. Top Surface Inc. representative, Shane Tyler will also attend to lend a helping hand and answer any questions your guests may have. When the party is up and running, he’ll hand it over to you! ENJOY THE PURCHASE YOU'VE MADE IN A CAMBRIA COUNTERTOP! No one will want to dim the lights at this event! Take the first step by contacting Shane Tyler at Top Surface Incorporated today so that he can work with you to let that celebration begin! To learn more about Top Surface Inc. or to set up an appointment with Shane Tyler of Sales & Marketing, simply call (614) 546.7199 or leave an email message above. For estimates, contact Shane Tyler or Operations Manager Eric Zuzak at (740) 965.4867. We look forward to meeting with you soon. Copyright © 2018 Top Surface Inc. - All Rights Reserved.